127 Q. What does the sixth request mean? to hold our own even for a moment. until we finally win the complete victory. 128 Q. What does your conclusion to this prayer mean? should receive all the praise, forever. 129 Q. What does that little word “Amen” express? This is sure to be! And turn from pride and sinful ways. A breath, a fleeting breath, is man. And all his toil is but in vain. And now, O Lord, what wait I for? From all transgression set me free. Until these troubles pass away. And me from every foe defend. Will rescue me with truth and grace. O’er all the earth Thy hands have made. “And so, Lord, uphold us and make us strong with the strength of your Holy Spirit, so that we may not go down to defeat in this spiritual struggle, but may firmly resist our enemies until we finally win the complete victory.” Talk about comfort! No matter how fiercely the battle may rage around us, our ultimate victory is sure, because Christ our Savior has already won it. Psalm 18 gives exuberant voice to this confidence. “The LORD dealt with me according to my righteousness,” says David in v. 20. Although we are no more righteous than David was, we have been granted the righteousness of Chrirst, and the final triumph along with it. “This God—his way is perfect; the word of the LORD proves true; he is a shield for all those who take refuge in him” (v. 30). Will find the Lord their shield and stay. Beside the Lord, our God of might? The Lord who guides my steps aright. Thy gentleness has made me great. “We have made all these requests of you because, as our all-powerful king, you not only want to, but are able to give us all that is good…” In confidence that God will hear and answer our prayers, we eagerly await the day when his saving power will be known among all nations (Psalm 67:2). To us her fruit shall bring. “…and because your holy name, and not we ourselves, should receive all the praise, forever.” Not only does this beautiful statement capture the essence of the Lord’s Prayer, it also serves as the capstone of the entire Heidelberg Catechism. “In reckless disobedience” (Lord’s Day 4, Q&A 9) we rebelled against the good commands of God. Yet in his great mercy, God provided “our Lord Jesus Christ, who was given us to set us completely free and to make us right with God” (Lord’s Day 6, Q&A 18), enabling each of his elect to say, “By faith I am a member of Christ and so I share in his anointing” (Lord’s Day 12, Q&A 32). While we “confidently await as judge the very One who has already stood trial in [our] place before God” (Lord’s Day 19, Q&A 52), we are comforted and strengthened by the Holy Spirit, who produces in us “wholehearted joy in God through Christ and a delight to do every kind of good as God wants us to” (Lord’s Day 33, Q&A 90). Indeed, “his divine power has granted to us all things that pertain to life and godliness” (II Peter 1:3)—and therefore his holy name, and not we ourselves, should receive all the praise forever. All that breathe, His praise proclaim. “This is sure to be!” With that one little word, “Amen,” we express our unshakable confidence in God’s promises to us. Even when our faith falters and our comfort wanes, it is sure—as sure as we really desire what we pray for—that we belong, body and soul, in life and in death, to our faithful Savior Jesus Christ. Because we belong to him Christ, by his Spirit, assures us of eternal life and makes us wholeheartedly willing and ready from now on to live for him. To that one triune God be the glory forever and ever. Amen! Amen! so let it be. “And forgive us our debts, as we have forgiven our debtors,” reads the second-to-last request of the Lord’s Prayer. This request forces us to ask: Have we forgiven our debtors? For that matter, do we truly understand what it means to be forgiven? And if we are forgiven, why must we still pray for forgiveness? Lord’s Day 51 of the Heidelberg Catechism, today’s topic on URC Psalmody, offers the outline of an answer. 126 Q. What does the fifth request mean? or the evil that constantly clings to us. Changeless from the days of old. For Thy goodness’ sake, O Lord. Making them His way to know. And let Thy wrath no longer burn. Forever shall Thy wrath increase? And Thy salvation’s joy restore. “Forgive us just as we are fully determined, as evidence of your grace in us, to forgive our neighbors.” In gratitude for the Lord’s deliverance, the author of Psalm 116 declares, “I will walk before the LORD in the land of the living” (v. 9). If we sincerely desire to walk in God’s ways, we must begin by forgiving our own neighbors. At the end of the Lord’s Prayer, Christ himself issues this warning: “For if you forgive others their trespasses, your heavenly Father will also forgive you, but if you do not forgive others their trespasses, neither will your Father forgive your trespasses” (Matt. 6:14,15). Should anything less be expected of those who have been forgiven so much? His help to me in time of need. From sin and sorrow set thee free. With Him I walk, and Him I praise. 125 Q. What does the fourth request mean? can do us any good without your blessing. and to put trust in you alone. One of the most poignant passages of Scripture regarding God’s provision and protection is Psalm 121. Below are selected stanzas from the Genevan setting in the blue Psalter Hymnal. His aid is freely given. Naught shall thy soul encumber. He will preserve thy soul. “[N]either our work and worry nor your gifts can do us any good without your blessing.” Psalm 4 describes the lingering anxiety of those whose material needs are met, but who have themselves not met with God’s favor. “There are many who say, ‘Who will show us some good? Lift up the light of your face upon us, O LORD!’” In contrast, the psalmist prays in complete composure, “You have put more joy in my heart than they have when their grain and wine abound.” Because his heart is right before the Lord he is able to “both lie down and sleep” (vv. 6-8), resting in the One who alone makes him dwell in safety. O who will show us any good? “And so help us to give up our trust in creatures and to put trust in you alone.” When we sincerely pray, “Give us this day our daily bread,” we acknowledge that God alone can supply our deepest physical and spiritual needs. As we fight our daily battles against sin, the world, and the devil, trusting in anything apart from God will cause us to stumble. “Oh grant us help against the foe,” cries David in Psalm 108, “for vain is the salvation of man! With God we shall do valiantly; it is he who will tread down our foes” (vv. 12, 13). If Thou Thine aid afford. Of my God through all my days. And his purposes shall end. On the Lord his God is stayed. Makes the sightless eyes to see. Judgment on the wicked sends. “God’s will” is one of those trite phrases often flippantly thrown around in 21st-century Christian jargon. However, as the Heidelberg Catechism shows in Lord’s Day 49, seeking God’s will is a deep and crucial aspect of the believer’s walk. 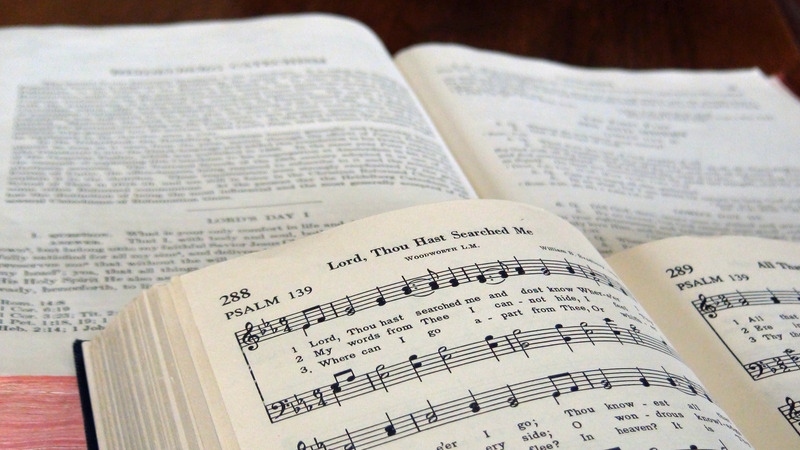 Today we turn to this brief question and answer in our continuing URC Psalmody series. 124 Q. What does the third request mean? and to obey your will without any back talk. Your will alone is good. as willingly and faithfully as the angels in heaven. Thy truth Thou hast made known. Of Thy most holy Word. And all Thy law is true. The earth abides at Thy command. And all as servants wait Thy will. O save me, Lord, for I am Thine. But boundless is Thy wondrous law. Old and young, your voices raise. Reigns the Lord in kingly state. 123 Q. What does the second request mean? that more and more we submit to you. Keep your church strong, and add to it. and every conspiracy against your Word. And worship Him as God alone. The glorious honor of His Name. What wondrous works the Lord has wrought. The Lord of lords, the King of kings. “Keep your church strong, and add to it.” The Church is the New Testament version of Mount Zion, the city of the Lord. As Psalm 87 says, “On the holy mount stands the city he founded . . . Glorious things of you are spoken, O city of God” (vv. 1, 3). By “Thy kingdom come,” we pray that God’s Church—the visible manifestation of his kingdom on earth—would be strengthened and increased. Indeed, Psalm 87 relates how God brings into his kingdom not only Israelites but also foreigners from every corner of the world—even people from nations hostile toward Israel. What a testimony to his abounding and unconditional grace! Who can all thy glory tell? Shall on Zion strength bestow. “Destroy the devil’s work; destroy every force which revolts against you and every conspiracy against your Word. Do this until your kingdom is so complete and perfect that in it you are all in all.” We close our study of this portion of the Lord’s Prayer with an excerpt from another messianic psalm: Psalm 72. Here the psalmist prays for God’s blessing on the reign of his anointed King, Jesus Christ. As the Lord destroys every force of evil, crushing the oppressor (v. 4) and making his enemies lick the dust (v. 9), our prayer for the righteous to flourish and lasting peace to abound (v. 7) will come true. In praying “Thy kingdom come,” then, we are effectively saying this: Come quickly, Lord Jesus! And give the poor redress. Shall bear the fruit of peace. Who would the poor oppress. On earth its light bestows. So shall His coming be.